As the spirits lead groups of druids together, the druids perform rituals that award points. At the end of the game, players reveal their hidden identities, and the player with the most points wins. The game board is divided into 60 spaces and 12 regions. A space consists of a single terrain type (shown by its illustration and color). A group of five spaces forms a region, which is separated from other regions by water (a combination of rivers and lakes). During the game, players move druids between these spaces, isolating groups of druids to score points. 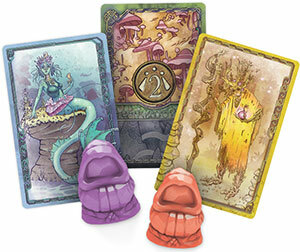 During setup, you are dealt a spirit card whose color matches one of the druid and scoring marker colors. Your color is known only to you until it is revealed at the end of the game. During the game, scoring occurs anonymously by color. When points are scored, any player can physically move any of the scoring markers, but you will not know who benefited from those points (other than yourself). All five colors are present in every game; one or more of the colors is not dealt to any player. These "neutral colors" can still score points. 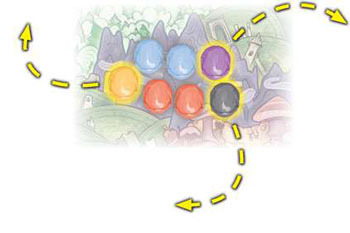 As the game progresses, by paying careful attention to what the other players do on their turns, you might gain insight into which color they have and use that to your advantage. Place the game board in the middle of the table. Place all scoring markers (regardless of the number of players) on the starting space of the scoring track, located in the top-left corner of the board. Randomly place all 60 druids on the board. Each space must have only one druid in it, and each region must have exactly one druid of each color in its five spaces. Note that druid colors are not tied to terrain type. •Shuffle the five spirit cards and deal one facedown to each player. Return any undealt spirit cards to the box without looking at them. 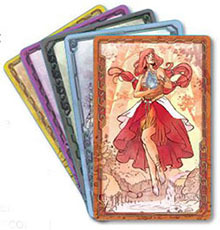 Each player secretly looks at his or her card without showing it to any other player; the front of the card shows that player's influence color and spirit. Sort the ritual cards into piles by the value shown on the front of each card. Place these piles near the board, from left to right, in ascending order from "1" to "5". In Fae, you move druids around the board into spaces containing other druids. When one or more druids are surrounded by empty spaces, a ritual is initiated, and certain colors might score points. The game is played over a series of turns starting with the oldest player at the table and proceeding clockwise. During your turn, you choose a space containing one or more druids and move all of those druids into an adjacent space also containing one or more druids. You must move all of the druids out of the chosen space. The space you move the druids out of and the space you move them into can contain any combination of druid colors, including or not including your own. You cannot move druids into an empty space. If a space contains seven or more druids, you cannot move the druids out of that space (but you can still move other druids into it). You can move druids across rivers, but not across lakes. After you move druids, if a space containing one or more druids becomes isolated (all of its adjacent spaces contain no other druids), a ritual occurs. 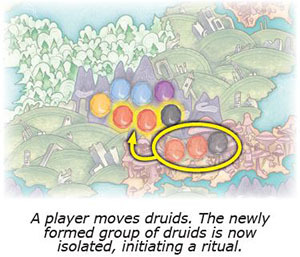 Note that it is possible for a single move to isolate multiple spaces with druids. If this happens, you resolve all rituals one at a time in the order of your choice. When you isolate one or more druids and initiate a ritual, take the top ritual card of the leftmost pile. Ritual cards represent the ever-changing flow of magic within the realm, shown by the two terrain types on each card. 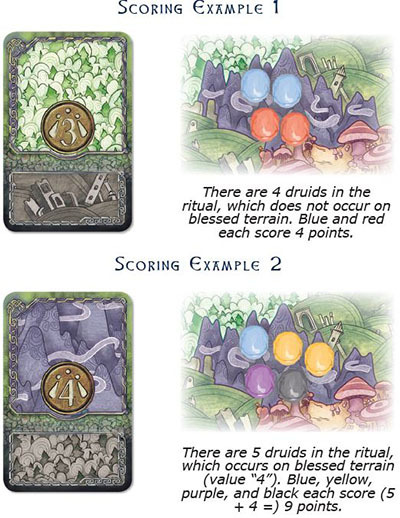 The top of the card shows blessed terrain, which increases the number of points scored for the ritual by the value shown on the card. The bottom of the card shows cursed terrain, which is one way that a ritual can be disrupted. To resolve a ritual, first check to see if the ritual is disrupted, then score it. A disruption in the ritual causes druids in the ritual space to vanish, which reduces how many points the ritual is worth. If a ritual occurs on cursed terrain, return all of the druids on that space to the box. No colors score any points for this ritual. If all five colors are present, return any lone druids of each color to the box. After resolving disruption (and removing druids), players check the ritual's final value. Each remaining druid (regardless of color) in the ritual space is worth one point. 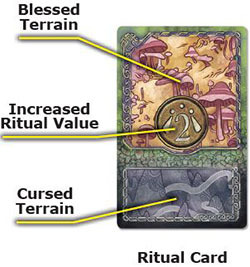 If the ritual occurs on blessed terrain, the ritual is worth additional points as shown on the card. After checking the ritual's final value, advance each of the scoring markers matching the druid colors in the ritual by that value. All of those colors score the same amount regardless of how many druids of each color were present for the ritual. After scoring a ritual (even if it was disrupted), the player who initiated the ritual keeps the ritual card facedown in front of him or her. At the end of the game, each ritual card a player has is worth one point. Note that the final ritual card (value "5") has no cursed terrain. Instead, all terrain types are blessed for that final ritual. The 12th ritual (the last card) has been resolved. 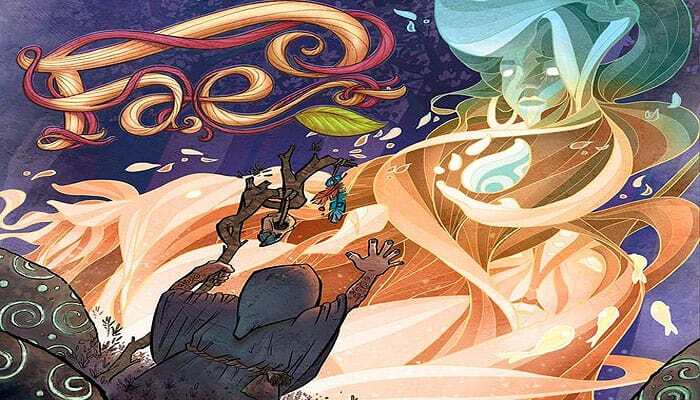 player cannot take his or her turn (i.e., no druid moves are possible). When the game ends, players reveal their spirit cards. Then, each player counts the number of ritual cards he or she has, scoring one point in his or her color for each. Then, players compare scores. The player with the most points wins! If there is a tie, the tied player with the fewest ritual cards wins. If there is still a tie, those tied players share the victory.